Words: the 0.5mm side. Lines: the 1.2mm side, with lots of variation. Don’t they look lovely in the myriad of colours? 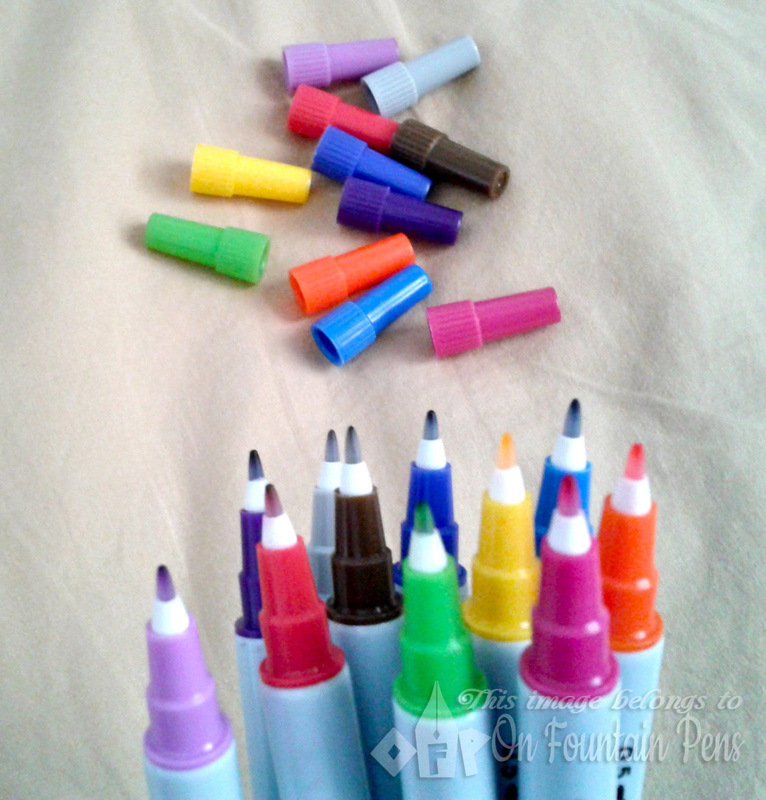 I first started using these during my secondary school days (2001-2004) and they were incredibly popular in a convent school where the girls loved to decorate their notes, write postcards to each other, or simply using them for notation or highlighting purposes. The reason was because these pens are double-ended, which meant that I can use one end (0.5mm thickness) for normal writing, and the other end (1.2mm thickness) for colouring, marking, highlighting or decorating. 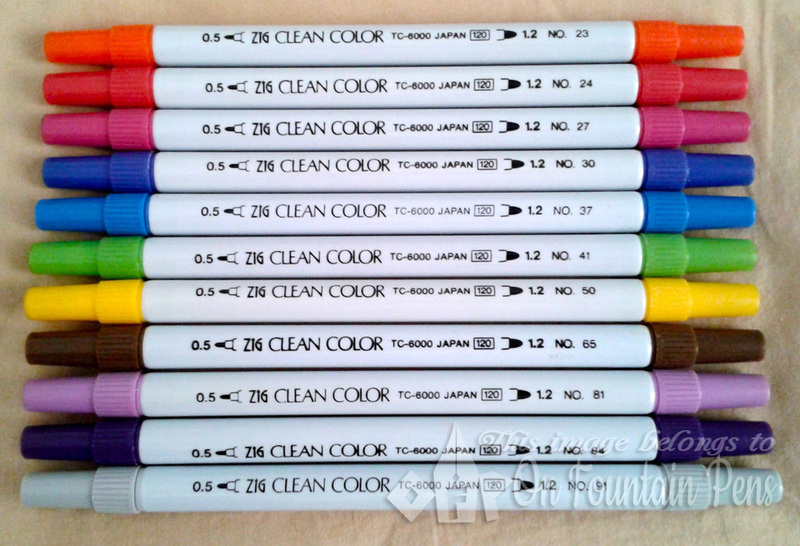 The line thickness varies among pens, and also depends on the amount of usage you put on the pen. For the 0.5mm side, they are pretty consistent. However I observed that for pens that are more frequently used, if you have a heavy touch like me, the thickness of the 1.2mm side tends to increase over time, less for some pens and more for others. Looking at the sample writing, you can probably guess which ones are my favourites that have been used more frequently, judging from the line thickness. #37, #65 and #91 were my three newest acquisitions from Popular Bookstore two days ago. Sorry, couldn’t help it. It is still possibly to achieve a thinner line with a light touch, but I would prefer the 1.2mm side to be THICK. I normally use that side for writing huge words such as on a card, or for colouring. So of course it would be more favourable to have a super thick line for colouring, no? I forgot to mention that I have two more colours which I had left totally forgotten in the office: a non-shiny gold and a darker grey than the #91. These pens are filled with water-based inks, which means that a downside is that they are not suitable to mark on metal, glass etc. kinds of surfaces. It would be nice to have these colours on a piece of ceramic or glass for decoration as a gift to a friend! Also, they get absorbed quickly onto wood and spreads apart along the wood fibres, like a fountain pen’s ink would, so it’s not ideal for wood too. That said, it also feathers and bleeds through on lousy paper. I have tried them on the lousy copier paper that I used at home and when colouring a few more times to achieve a darker shade, bits of paper fibres got rolled off along with the pen tip! 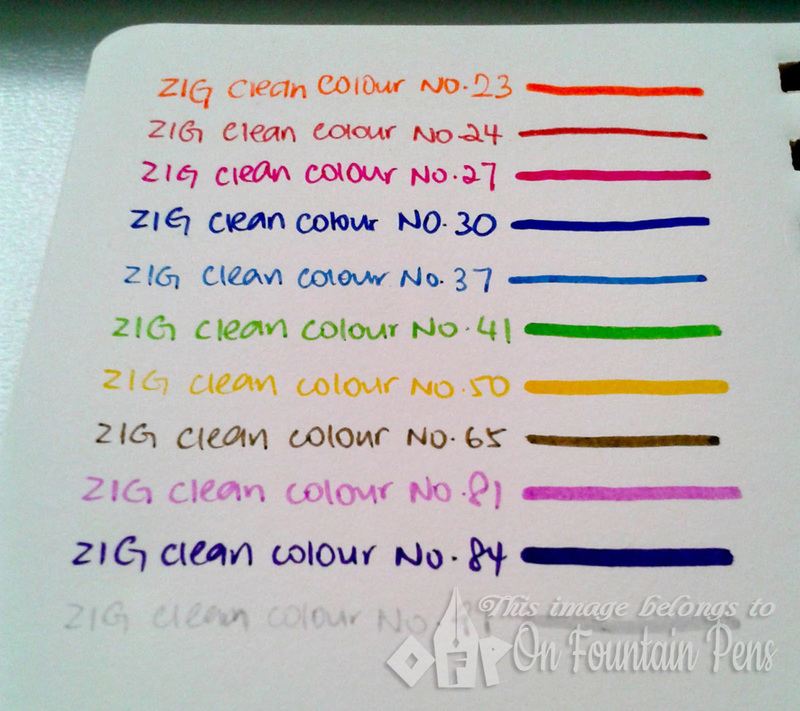 I would say that these ZIG Clean Colour pens are at a good price – I bought them for 1.95 SGD each at Popular bookstore, and if you are a member I believe you also get some discount off the total bill. 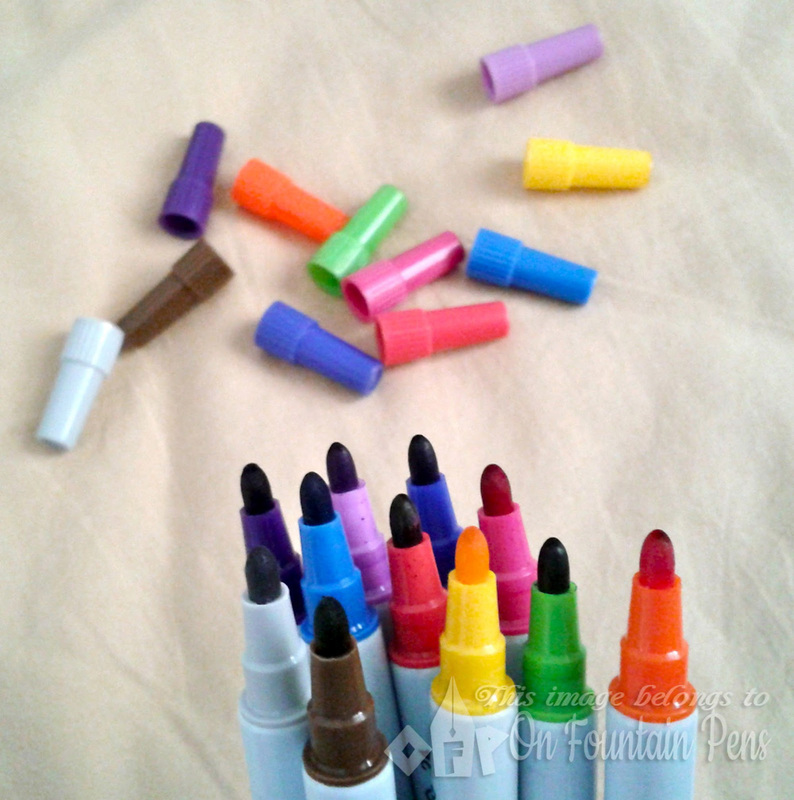 Let’s say you pay for two pens since this is double-sided, which means it’s about $1 per side… it’s not too bad! 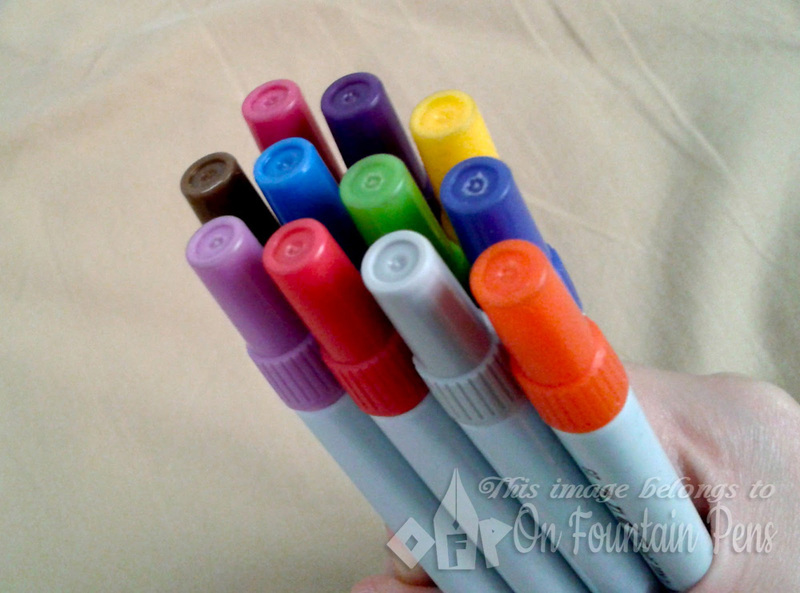 Considering that these pens are not very frequently-used unless you are an artist who use them for decorative purposes everyday, they are pretty reasonably-priced. And they can be kept for a long time as long as they are capped, they don’t dry out that quickly! Reference: yellow and green pens were given to me by a cousin who had used it since more than 5 years ago (rough estimate), and they still work well! The other colours like the orange, pink, red, dark blue and purples had been left unused in my pencil case for about 6 months (max) and they still write as well as when they were brand new off the shelves!